Along with the illustrations to Edward Young’s Night Thoughts, the poetry of Thomas Gray, and John Milton’s poems, the 102 Dante water colors are among Blake’s most important series of illustrations of another poet. They were commissioned by John Linnell, the chief patron of Blake’s final years. Although Linnell did not begin to pay for the designs until December 1825, at the rate of about 1 pound a week, Blake probably began work on the drawings by the fall of 1824. They were left at Blake’s death in 1827 in various stages of completion, ranging from pencil sketches to highly finished water colors. 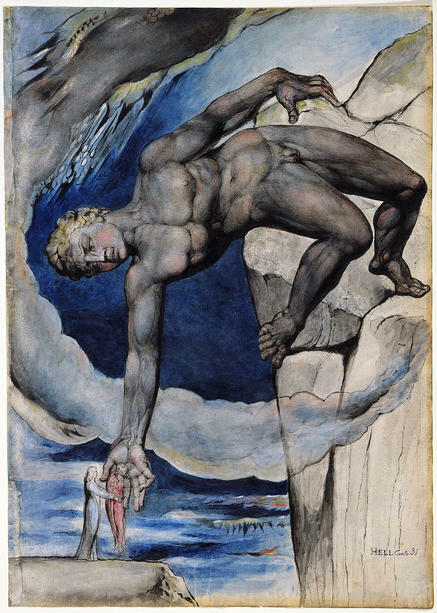 Most show an expressive freedom in the handling of color washes far greater than Blake’s earlier works in that medium. In 1826, Blake began to engrave large plates based on 7 of the designs; these were also left incomplete at his death. The water colors remained in Linnell’s collection and estate until their sale at auction in 1918. Through a scheme organized by the National Art Collections Fund, they were dispersed among 7 participating institutions: Ashmolean Museum (3 designs), Birmingham Museums & Art Gallery (6 designs), British Museum (13 designs), Fogg Art Museum (23 designs) National Gallery of Victoria (36 designs), Royal Institution of Cornwall (1 design), and Tate Collection (20 designs). The Archive has brought this dispersed group of water colors together. The digital lightbox feature enables users to compare images within the series and with all other works in the Archive. Pingback: Publication Announcement – Water color illustrations to Dante’s Divine Comedy | Uncategorized | Aggregated blogs on Romantic Studies - please click through to read full posts.